Going to Prom? We here at Party Bus Denver are here to help you plan a night that you will not forget and we want to make sure it is a lasting memory. All of our vehicles are insured and come stocked with soda and water, they are fully equipped with Tv’s, surround sound and much more!. We want you to arrive in style with one of our luxurious limousines or Buses which range from SUV’s, Chrysler 300’s, Cadillac Escalades and Mini Limo Sprinters and Party Buses. Our mission is to customize a prom limo package that exceeds your expectations. Party Bus Denver is dedicated to the overall safety and security of all of our passengers. When it comes to transportation to prom we go above and beyond to protect your safety. Our chauffeurs are experienced and will ensure the safety of our clients. We have been in service since 1993 and we continue to strive for the best service in the Denver Metro Area. For more information about our prom limo services in Denver Metro and surrounding cities and to customize a package that fits your needs and budget; please contact our professional staff today. ​Are you looking to make a splash for your group and make prom night something really special? Instead of going with the status quo, pitch in together and get in a luxury limousine bus that will take your entire night to the next level. Get the music blasting, enjoy the luxury ride, and most importantly, blow everyone away when you arrive in a limousine bus that cements your status as the classiest in your class. 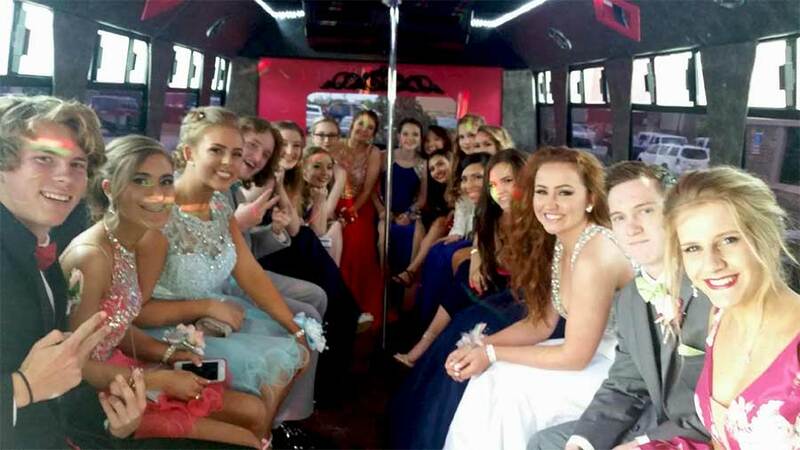 Prom night is all about making memories and enjoying the moment, a limousine bus will definitely help make some truly special moments to remember. It is also one of the best transportation forms to sell your parents on for prom night for several reasons. For starters, there is obviously the safety issue. On prom night, there can be serious safety issues with reckless folks on the road. In a limousine bus, you have a professional driver taking care of your group and keeping everyone safe for the entire night. It is also a more cost-efficient option, because you will be able to split the costs up between each person in your group. If you are a parent and are looking for a way to make sure that your kids are able to have an awesome time for prom, not overspend, and stay safe for the entire night, a limousine bus is the way to go. Contact us today to get a free quote on a limousine bus rental.